I’ve always suspected I’m secretly great at something. The problem is that I haven’t quite found that thing I’m great at. Over the years I’ve learned it’s not drawing, writing, photography, improv, film making, pottery, gymnastics or tennis, but I’ve never given up hope (as you can tell). Earlier this year I decided it might be special effects makeup based on the fact that I’ve shown little interest in it over the years other than applying a bruise makeup once to scare my cousin into thinking she’d get in trouble after she accidentally popped me in the eye. (For the record, it had the desired effect.) I bolstered my belief in my hidden SFX talent, because I’d seen many seasons of Face Off, the Syfy channel’s SFX makeup reality show/contest, and in HIgh School I did have that Bob Kelly make-up kit that is in almost pristine condition after opening it at least two or three times. Clearly, SFX makeup was my calling. My friend April, you know the one who occasionally tries to kill me, the one I’m going to New Orleans with next week out of curiosity to see what she has in store for my demise this time (expect updates if I survive) – that April. 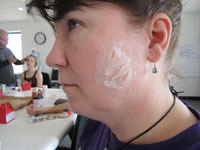 Anyway, April saw that the Austin Film Society was holding a SFX Makeup 101 class taught by one of the former Face Off contestants. 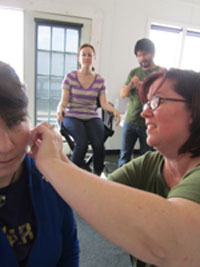 She let me know, because I think she also suspected I had hidden talents – perhaps even be a burgeoning SFX makeup star. I’m sure it wasn’t because I might be star struck by a local artist (the teacher) being a Face Off contestant and this fulfilling some stalkery need of mine. Yes, I’m sure that’s why she told me – the hidden talent thing. Did I mention he was a contestant on Face Off? My friend Topping joined me. Off we go to the class and there he is – the Face Off guy. He’s nice, patient and pretty cool. He told us a few stories and then gave us these tiny little take-away kits to create wounds. Then he laid out some silicone prosthetics. We each chose one. I, of course, picked a wound to put directly on Topping’s face. I’m sure deep down she was delighted by my choice even if she wasn’t readily showing it. As a much kinder person (better person blah, blah, blah), she picked one for my arm. My first (and only) application went ok. I killed an edge, but what Face Off participant hasn’t really? Then it came time to paint it. I wanted something a bit bloody in the center. It was a tear across her face – like she’d been attacked by a serving fork – maybe she tangled with an animal with serving utensils for feet? It could happen! I decided what the wound needed was some deep reds with dark blues and purples, then on the edge I wanted some nasty yellow – maybe yellow with some red in there. It’s been a long time since I was in an art class or even colored or considered a color wheel. All of my age 7 year old art class experience in color suddenly came crashing back into my brain when I used the aforementioned bright yellow, liberally applied some red and I made orange. Orange. Imagine my surprise, which was quite genuine, as my inner 7 year old mocked away. It was a gigantic bright orange wound right on Topping’s face. I tried to make it better by adding more colors to cover up the orange. This ultimately ended up making her wound look like some depraved 1970’s mom had assaulted her with a bottle of mecuricome. It was a wound disaster that she got to have her photo taken with to remember throughout time and enjoy the added bonus of having to wear it out of the class on her drive home. You’re welcome, Topping. Even Oranger in Person! The blending is pretty gorgeous, too. 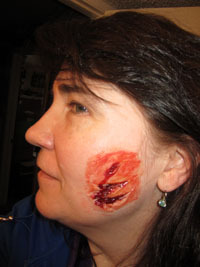 My take away – I think that maybe being a SFX makeup artist may not be my hidden talent. Time to sign up for the next class. This entry was posted in Friends, Geeky Things, Me and tagged April, Face Off, Personal Discovery, SFX, talent, Topping Haggerty. Okay Beth, you need to blog more. This is the only way I can get my Beth fix now! I can’t wait to hear all about New Orleans! I need to get out of the house more. Otherwise, I’ll be milking the New Orleans adventures for months to come. Actually, we still use mercurochrome here, so that looked totally realistic to me. See, that’s what any rational person would do if they slipped back in time or were in Japan. Cover the gaping wound with mercuricome and mayor apply a butterfly bandage. All better! Really I’m ahead (or perhaps behind) my time. Looks pretty oozie to me.